Dr. Janice MacKinnon served as a Saskatchewan cabinet minister from 1991 to 2001. She is a Fellow of the Royal Society of Canada and member of the Order of Canada. She holds a PhD and Master of Arts degree from Queen’s University and is an executive fellow at the University of Calgary School of Public Policy and Professor of Fiscal Policy at the University of Saskatchewan School of Public Health. She has authored three books and many articles on public policy issues. She served as chair of the Institute for Research on Public Policy board, chair of Canada’s Economic Advisory Council, a board member of the Canada West Foundation, a member of the National Task Force on Financial Literacy and is currently the Chair of the Ombudservice for Life and Health Insurance (OLHI). Clayton Manness is a former MLA representing the constituency of Morris. He earned his M.Sc. in agricultural economics and worked in the grain industry before entering public life. During his time in office, he served as minister of finance, minister of education and training and government house leader. He later served as chair of Prairie Flax Products Inc. and president of Man Agra Capital Inc.
Manness has led previous commissions dealing with taxation (provincial government) and searching for alternative revenue sources (Winnipeg). Presently he is a public director of the Mutual Funds Dealers Association, Investment Protection Corporation, and president and CEO of Prairie Flour Mills at Elie. He continues to farm as part of Manness Farms Joint Venture. Terry Brown of Winnipeg is an owner and partner of Legacy Bowes Group and leads the business advisory practice. Terry advises business entities, Indigenous communities and Indigenous entities on policy initiatives, corporate setups, joint ventures, mergers, and acquisitions. He currently serves as on the BUILD and Mother Earth Recycling boards, is the past chair for the Aboriginal Chamber of Commerce and is a past policy committee member for the Manitoba Chamber of Commerce. He holds a Bachelor of Commerce and is currently a mentor for the MBA students in the Asper School of Business. Mark Frison was named President of Assiniboine Community College in 2010. Prior to that position, Frison was the founding president of Great Plains College in Saskatchewan, which was formed by the voluntary merger of Prairie West Regional College and Cypress Hills College (of which Mark was also president). Mark began his career working as a policy advisor in the Nova Scotia Department of Education. Following that, Frison worked in a number of roles in economic development for the Government of Canada. Frison has served as a member of Nova Scotia Council on Higher Education and Maritime Provinces Higher Education Commission. J.D. Lees is a former science teacher at Steinbach Regional Secondary School who also taught English overseas. He holds a Bachelor of Science in Zoology and Bachelor of Arts in Political Science from the University of Manitoba. He is the editor and publisher of G-FAN Magazine. Jill Quilty is a lawyer with Law North Law Corporation and practices criminal, divorce and family law. She previously worked as an instructor and coordinator at College of the North Atlantic in Newfoundland and Labrador. She holds a Juris Doctorate from Dalhousie University’s Schulich School of Law and a Master of Education from Mount Saint Vincent University. She has volunteered with the Juniper Centre in Thompson and served as a member of the Truth and Reconciliation Academic Working Group, the Ad Hoc Response Committee for Gender Discrimination and the Indigenous, Black and Mi’kmaq Standing Committee. Laurel Repski of Winnipeg is a former vice president (human resources, sustainability and audit) at the University of Winnipeg (2006 to December 2018). She previously served as vice president (human resources) for the Canadian Wheat Board (2000 to 2006). She holds a certificate in human resource management from the University of Manitoba and has completed numerous related professional and leadership development programs. Her community involvement includes serving as a director for the All Charities Campaign, serving on the board of directors for the Manitoba Children’s Museum and serving as chair and a member of the executive of the Manitoba Theatre for Young People. Denis Robert has taught a variety of Grade 5 to 12 subjects, both in English and French immersion schools, including K to 12 physical education. He was a full-time teaching vice-principal in a K to 8 school, a full-time Directeur-adjoint at Collège Béliveau for two years, and Directeur of Collège Béliveau in the last eight years of his 32-year teaching career. Collège Béliveau was the first total French immersion high school in Manitoba. He holds a Bachelor of Arts degree and a pre- Masters in Educational Administration from l’Université de Saint-Boniface and a Bachelor of Education degree from the University of Manitoba. After his teaching career, he owned and operated (Les serres) Robert Greenhouses, volunteered with the 1999 Pan-Am Games, the 2017 Canada Games, Meals on Wheels, Christmas Cheer Board and Winnipeg Harvest. He has carried out humanitarian work with Red River Mission (Rivière Rouge) in the Dominican Republic, Haiti, Peru, Malawi and Bolivia. 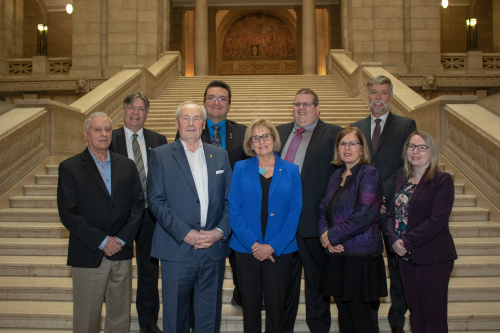 Ian Wishart was first elected as the Member of the Legislative Assembly for Portage la Prairie in 2011 and appointed to cabinet as Minister of Education and Training from 2016 to 2018. Wishart holds a Bachelor of Science in Agriculture from the University of Manitoba, worked as a cattle producer and served as president and vice-president of Keystone Agricultural Producers, on the Canadian Federation of Agriculture executive and the Manitoba Crop Insurance Board and Manitoba Water Council. He received the Agri Food Award of Excellence for his environmental work on the Alternate Land Use Services (ALUS) program and has volunteered with several boards, including the Portage Fair, Delta Agricultural Conservation Co-op and Centennial Community Club.